Lily, the white horse abandoned at the New Holland auctions in March has been adopted by comedian Jon Stewart and his wife Tracey, who are opening an animal sanctuary in New Jersey. 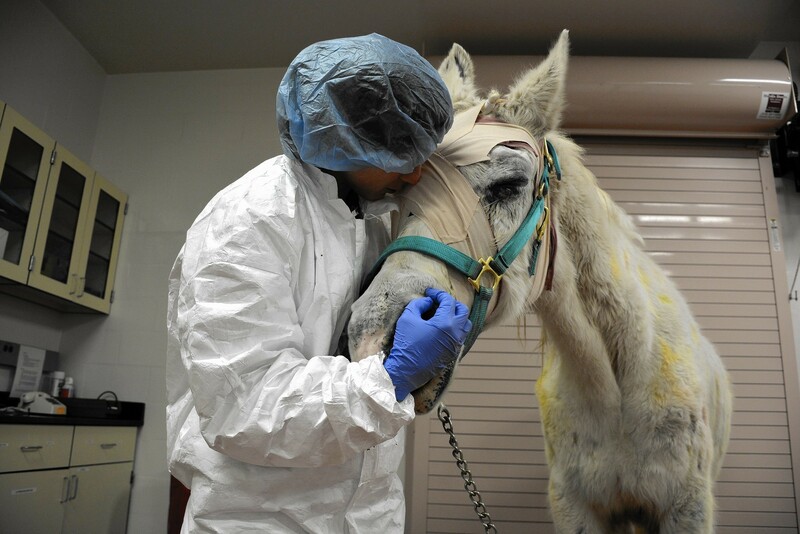 It’s a happy ending for the elderly mare who was found after the auction closed tied to a post, covered in paint stains, suffering from uveitis in both eyes, and severely malnourished. 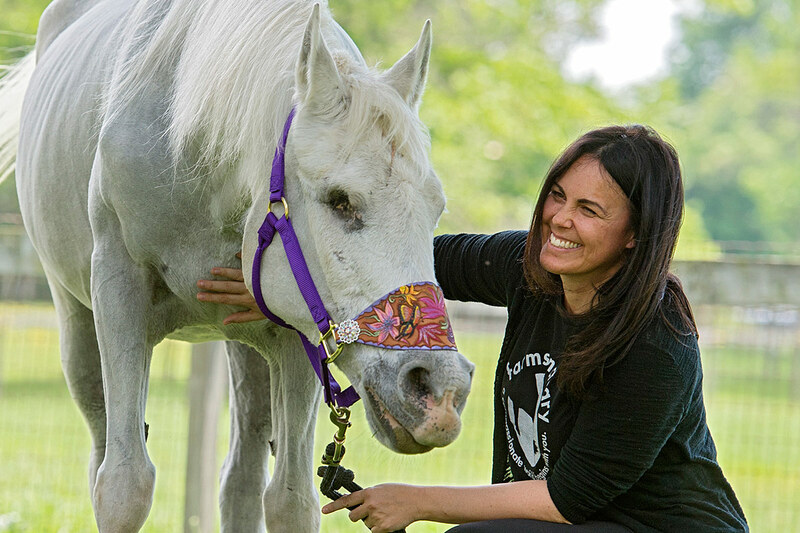 Lily has raised considerably awareness of the plight of abandoned horses. Her story hit the national news when it was reported that she had been shot more than a hundred times with a paintball gun. Thanks to surveillance cameras, the man who left her there was identified as Phillip Price of East Providence, RI. Price was subsequently convicted of three counts of animal cruelty a single count of dealing and handling animals without a license, and a single count of importing animals without an interstate health certificate. He was ordered to pay $3,056 in fines and $10,178 towards Lily’s care and recovery. Her right eye was removed but thanks to an experimental treatment, she regained 80% of her sight in her left eye. Lily was treated at the New Bolton Animal Hospital where one of her eyes was removed; she has regained 80% of he sight in the other eye. Then she won the adoption lottery when she was adopted by the Stewarts. However, the story isn’t quite over. Lily’s original owner was recently found. 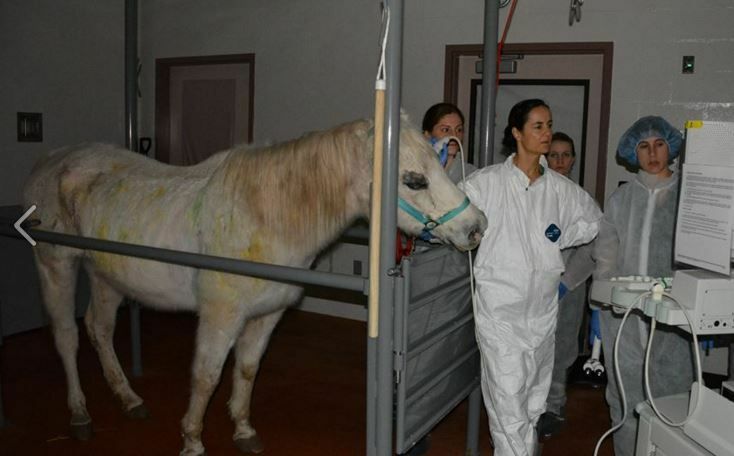 Doreen Weston, who owns Smoke Hollow Farm, claims that the horse “might” have been hers and that the paint was from birthday parties, not paint ball. She says she owned a white Arabian horse that she used for riding lessons and birthday parties, where children used the horse as a canvas for finger paints. Weston explained to reporters that Lily was 35 years old and that she had given the horse to Price when her health deteriorated because she “assumed” he would have it euthanized. Right. After you own a horse for 15+ years, you ship it off to a horse dealer. She claims that Price told her that he “had a place he could take her” and that she thought he meant a retirement facility. Right again. That’s exactly what dealers do — spend their own money to humanely euthanize a horse, or place an old sick horse in a retirement home. Even worse, Weston is claiming it might not even be her horse because the Vets at New Bolton described Lily as an Arabian/Appaloosa mix, while Lily is just an Arabian. Sure, there are lots of 30 year old gray mares dumped at New Holland that are covered in paint, have uveitis and dental problems. Your horse’s doppelganger just happened to be dumped at New Holland by the same dealer that you gave your elderly school horse. A horse that was still covered in paint from the last party she worked for you. A horse that looks remarkably like one pictured on your website. Shame on you Doreen Weston. That horse deserved better and no thanks to you, she had a soft landing. That poor horse. I am extremely glad she got adopted by good people who will treat her right. Shame on her “owner” and the “horse dealer” who are nothing less than filthy animal abusers who should rot in hell for all eternity.